Click for table of competitors' times. 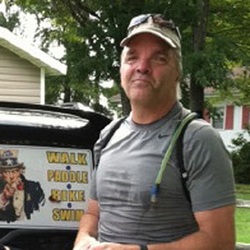 Read about Eric's 2011 experience, in "48 at 57; An X-TREME! View from the Top." Experience: TTL-X!, 2011 (Finished in 11:24:46 – Tied for First Place) & 2012; TTL-Traditional, 2009, 2010; Labor Day Swims (2 prior – 1992, 2003), 2011 White Lake Half Iron Man, 2011 Battleship Half Marathon. Why you signed up for TTL-X! : (See Edmund Hillary) I thought it would give me more time to help out with the administration of TTL on the day of the event instead of competing. Most important: a fun and worthwhile healthy community event in which the purpose is to stay exercise-engaged all year long. 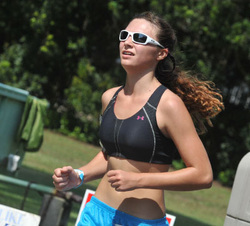 How well you think you'll do: At best, to be competitive with a decent run time. At worst – finish before dark. 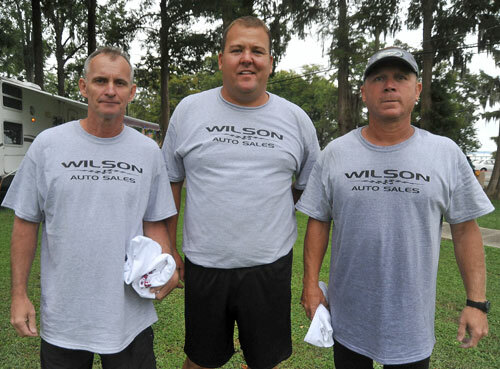 NOTE: Brandt tied for first place with Thomas Mintz in TTL-X! 2011 due to judges' technical errors. Excuses: Hey, those times are bogus, man! Brett and I do this together, and sometimes we'll set out trail flags, or other stuff that slows us down. If you don't like that, I can work up something better, OK? Why you signed up for TTL-X! : To be able to participate in these cool events and also organize them. Brett and I do TTL-X! a week before the others – not so we can cheat, but so we can organize TTL-X! for you, too. How well you think you'll do: In 2012, the whining got pretty bad – OK, fine. I got Brett some dam earplugs so he won't have to listen to it. Why you signed up for TTL-X! : Mark Gilchrist wanted to do it, and since I was a medic in the Marines, I signed up to accompany him. Actually, this is Gore's fourth year, as he and Mark first did all four PECs in one day in 2010 to see if it could be run as an event. Just saying. Profession: Veterinary Technician, office manager, real estate, ostrich and horse rancher, and queen of the world! Experience: Lots of triathlons,bike races,running races and every day is an adventure with my nutcase husband. Why you signed up for TTL-X! : A four-mile swim is something I've wanted to do for ever (and survive). How well you think you'll do: I will do my best and slow down a lot so I don't embarrass "You-know-who". Profession: Veterinarian, and whatever my wife tells me to do. 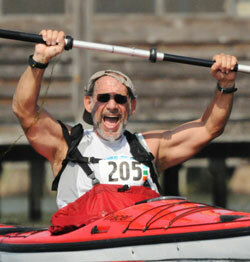 Experience: triathlons of all sorts, adventure races, marathons, ultras, etc. – i'm exhausted just writing it out. How well you think you'll do: I think i'll win no matter who comes in first place (as long as I beat you know who) and don't get eaten by a gator. Profession: Media coordinator for Chadbourn Middle and Elementary Schools. Why you signed up for TTL-X! : I am signing up because I want to give it another try since I know what to expect. How well you think you'll do: I have no idea how I will do, but I will do my very best. Experience: TTL-X! in 2012 (Time: 13:59:08). I have raced in the White Lake Double Sprint Triathlon, as well as multiple Spartan races, 5K's, and 10K's. Experience: Events this year so far: 17 mile hike (with 40lb vest), Bilo Marathon, The Hulk 10k Challenge, Tough Mudder, Rugged Maniac, Dirty Myrtle, Superhero Scramble. Why you signed up for TTL-X! : Many "normal" people spend their lives watching other people live Amazing Lives on TV... Instead of making their own lives Something Amazing to talk about in the break room. We have all been given the Gift of Life, and I just choose not to waste it. I AM making my life Amazing one race at a time. How well you think you'll do: The true race is only and always against your better self. That being said I may not be the Biggest, Fastest, or even the Best compared to others but I will do My Best and will strive to beat My Best next year. Watch a video interview with her here to hear why she signed up for TTL-X! and other cool stuff. 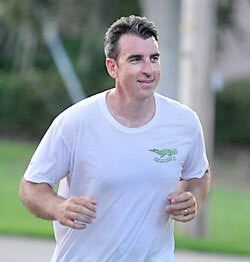 Read Dana's inspiring story about running in the 2013 Boston Marathon. Experience: TTL-X! in 20011 (Time: 12:29:56); The 2013 Boston Marathon (22 miles); Many events from century cycling, sprint to Iron distance tri’s, trail to marathon distance runs. The truth is “I'm not good at any of them! I just like doing them because I still can.” I love the camaraderie of the tribe who participate in these events – I have not found a more positive encouraging or interesting group of people. For me, it’s not about winning or finishing, but overcoming the point where you think you can’t go any more. Why you signed up for TTL-X! : Personal challenge. NOTE: Dana had to cancel the 2012 X-TREME! at the last minute, but had already paid, so he donated his fee to one of the teams. Post event comment: (2011) "...The X-Treme took me where I wanted to go, pushing me beyond where I thought I could go. 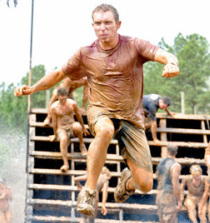 I must admit having done quite a few events.. this one was tough – maybe the toughest! 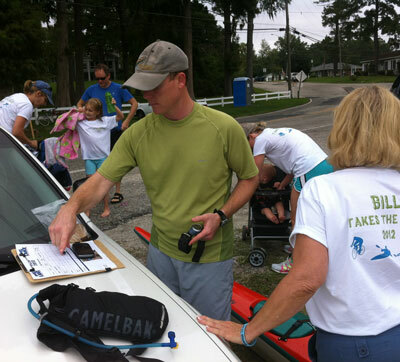 • I can not say enough about the residents of Lake Waccamaw, their kindness, encouragement, and support was outstanding! They should be proud to live in such a great community. • Thanks Again. Sign me up for next Year - Dana Mauldin"
Why you signed up for TTL-X! : Why? I have always wanted to participate in an event like this and have never had the opportunity before. How well you think you'll do: NOTE: Mintz tied for first place with Eric Brandt in TTL-X! 2011 due to judges' technical errors. Experience: TTL-X! 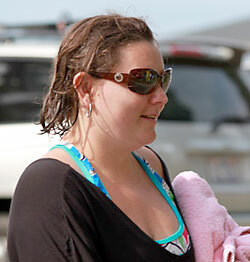 in 2011 (Time: 16:53:14) and 2012; Swam the Labor Day swim in 2003 and 2005 - before having children. Experience: TTL-X! in 2011 (Time: 13:46:00) and in 2012 (Time: 11:52:38); Numerous 5K, 8K & 10Ks, two sprint triathalons at Wrightsville Beach with CRHS. Labor Day Swim at 16 (no practice), at 40 (some practice) and at 50 (more practice!) TTL Cycle, Paddle & Run in 2009. 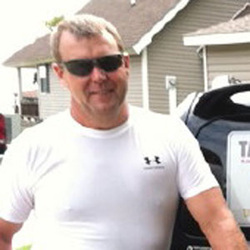 All four TTL PECs In 2010. Why you signed up for TTL-X! : Having a goal like TTL or TTL-X! is a good way to stay motivated. Also, I wanted to sponsor the refreshment tent at the end of the TTL Walk / Run. In order to be there for that, and to take part in TTL, I had to do the Extreme. Experience: have done Take the Lake the last several years with family and friends. Why you signed up for TTL-X! 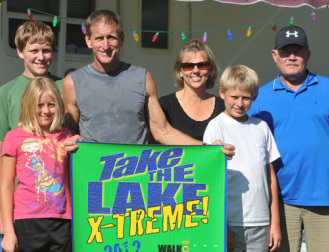 : Take the Lake has become a tradition, and I wanted to attempt the X-TREME! How well you think you'll do: Hope to finish! NOTE TO TEAMS: We are printing only FOUR team banners, which will go to the first four teams to register, pay fees and complete the X-TREME!, regardless of finish time. So, if you want your team to walk away with more than t-shirts and JAMAs, sign up and pay up ASAP! Why other teams should be intimidated: We have no idea of what we're doing. 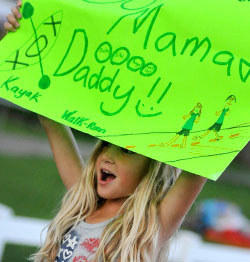 Kevin and Natalee at the 2010 Swim. 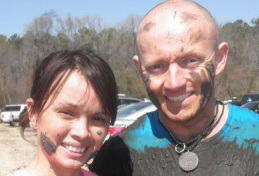 History: Natalee was our first "Celebrity Participant" in 2010, and her husband, Kevin helped her as her participation evolved from just the run on Saturday, to completing all four PECs that weekend. (See our Celebrities Page.) They live in Garner, but Natalee has a lot of family here, and we are thrilled to have them back! Predicted Total Finish Time: 11 hours, if we don't drown, crash, flip over, or walk. 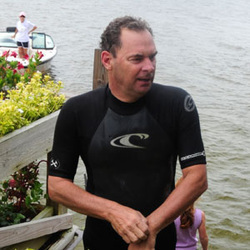 History: Leader Bill Sessoms has swum the Lake about four times (lost count) and did the X-TREME! last year in 10:50:08. Why other teams should be intimidated: We want to set a course record and win this thing this year. 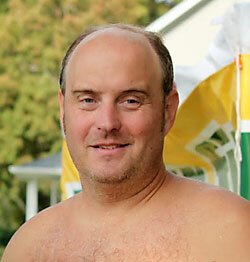 SWIM: Bill "Sub-two-hours" Sessoms - Swam 2:12:50 in 2012 TTL-X! History: Team Leader Vanessa Hawes was on the SCC team last year, and has rallied her colleagues into two teams this year! Why other teams should be intimidated: RAM-page is looking to rough up not only RAM-pant but the whole team competition. Go RAMS! 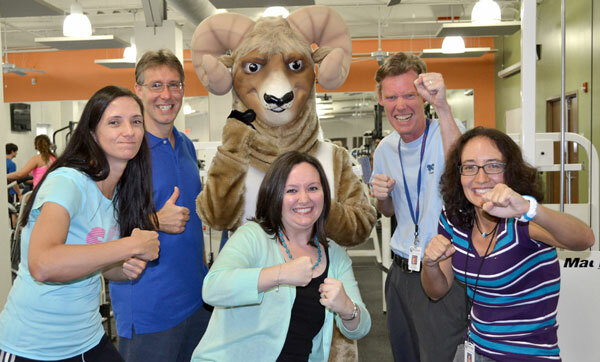 From left, Patricia Wright, Dr. Morgan Phillips, Andrea Jacobs, Rocco the Ram, James Hutcherson, Glenn Hanson. History: SCC's one team finished in 12:49:05 in 2012. That team split in half, with each pair finding two new members to form two teams this year. Why other teams should be intimidated: We are looking forward to putting up competitive times.